This issue cover of the TYPO3 reading list covers 13 weeks of links. Believe me, there have been many many more. Next to TYPO3 the main topic is accessibilty, but also “normal” webdev and php topics are part of this list. I have to say “Thank you very much” for your ongoing work on the TER and the relaunch of TYPO3.org! Events like barcamps, Developer Days or Agency Meetup Days are a central building block of the TYPO3 community. 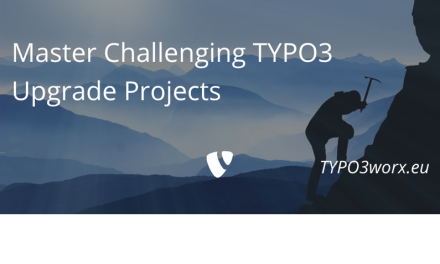 Wolfgang Wagner explain why and what you gain by attending these events yourself or by sending one or more employees in the post What you gain by taking part in TYPO3 events. Every time, when launching a new website, you may think: Did I forget something? HarrisJT made a nice checklist on https://weblaunchchecklist.com/, which lists 36 topics you should check before launch. The checklist is also available as pdf or docx. On July 11th several security bulletins for extensions were released. You find a list of them on https://typo3.org/teams/security/security-bulletins/. Please check, if one of your installations is hit by them and update immediately. Thanks to Torben Hansen for taking care and publishing them. Another “hot” topic in the last weeks seems to be “accessibility”. Many posts and initiatives crossed my timeline. Here are a few of them. The British government released several info graphics and explanations about the DOs and DONTs in this area. This recommendations do not only cover visual inabilities, but also topics like dyslexia and of the autistic spectrum. The mission of “Web Accessibility in Mind” of the Utah State University is to make web content accessible to people with disabilities. Their focus is to empower organisations to achieve is for example with the tool “wave”http://wave.webaim.org/. There you can enter an url and you get instantly an analysis of the website. Ok, the last thing is not really a reading recommendation. in the last weeks I stumbled over a composer GUI client. I do not know whether this is really necessary, but here is it anyway: https://downloads.getcomposercat.com/. I hope, that one or more recommendations have been interesting for you. If so or if you know somebody, who could profit from it, please share this post via your favorite social network. For your convenience I added some share buttons at the end of this page. I want to thank my supporters via patreon.com, who make this blog post possible. This time, I want to thank Romain Cainon for his support as a bronze supporter!. I particularly liked the post about exceptions!